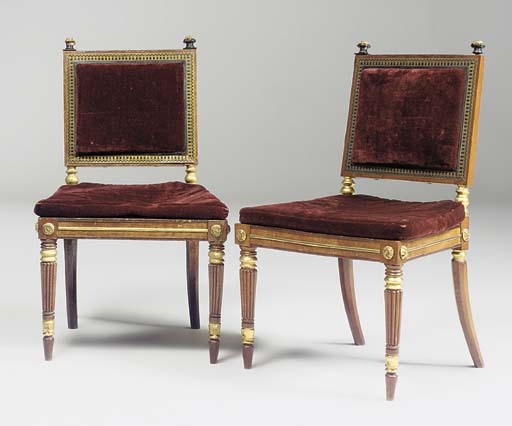 This pair of side chairs correspond to the set of eighteen side chairs from the 'Palmella' suite, sold anonymously, Christie's, London, 25 June 1987, lot 173. The latter was sold as part of a suite of matching furniture including a footstool, window seat, five wall brackets, three pelmets, a pair of torcheres, a pair of pier glasses, a display-stand, a commode and a sofa and eighteen chairs. This suite was supplied to Don Pedro de Souza e Holstein, 1st Duke of Palmella (1781-1850), Portuguese Ambassador to the Court of St. James's 1812-1815 and on three subsequent occasions. It may be that the suite was commissioned from the Tenterden Street cabinet-maker George Bullock (d. 1818) either by Don Pedro whilst in England or as a diplomatic gift from the Nation. A matching sofa from this suite was sold anonymously, Christie's London, 7 November 2003, lot 190 (£35,850).